If you're looking for a neat little device to charge your gadgets when you're out and about away from the grid you would give this one a try. Dual USB ports with maximum 3.5A total output and capability of charging two devices simultaneously. Keep your devices fully charged on the go in no time. Compatible with all iphones, tablets, GPS, Camera, rechargeable batteries and other USB-supported devices. 1. 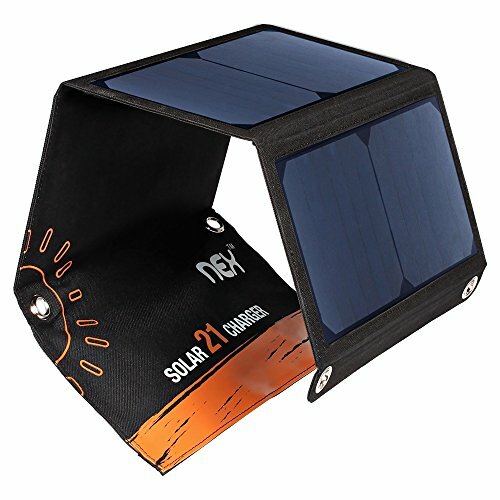 This item charges very fast in full sun but its charging efficiency is low on cloudy day. 2. This charger is not compatible with the iPod nano, iPod Classic, iPod Shuffle, HP TouchPad and Asus tablets. 3. No battery inside, environmentally and friendly, plugging while charging. 4. Please clean the solar panels regularly with soft cloth.